Focusing is a powerful way to connect with our own body's wisdom and intuitive knowing. A mindful and heartful process of offering respectful listening presence to "something inside," this practice can help us heal physically and emotionally, unblock our creativity, and deepen our spiritual practice. Bebe Simon first learned Focusing from Eugene Gendlin in the 1980s, and was soon asked by him to assist in teaching workshops. She quickly became one of the more innovative teachers of this work, guided by her deep intuitive skill in accompanying others in their Focusing and informed by the many original discoveries that she made along the way. 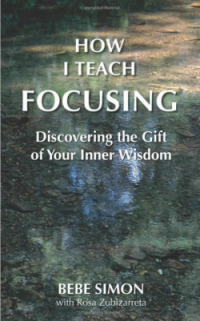 As a Focusing Coordinator authorized by the Focusing Institute to certify trainers, Bebe has a worldwide reputation for presenting workshops in her own distinctive style, travelling yearly to the Focusing International conference where she shares her teaching approach, her insights, and her many stories. Pre-order: This book will be available to ship the end of January 2015.